Copyright © 2019 All Rights Reserved. Musictoday II, LLC, is the seller of all Jeff Bridges and The Abiders merchandise and is solely responsible for all aspects of your purchase. 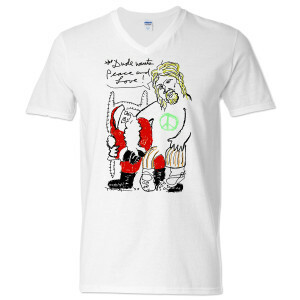 Featuring original artwork by Jeff Bridges and printed on 100% organic cotton from Farm Fresh Clothing Co., this v-neck t-shirt is made in America and perfect for the holiday season!